The response to my poll about whether readers thought Vibram Five Fingers were fun and funky, or a fashion faux pas came out overwhelmingly on the side of fun and funky. As a result, I have decided to inflict Five Finger Friday on my loyal readers, and my family and co-workers. 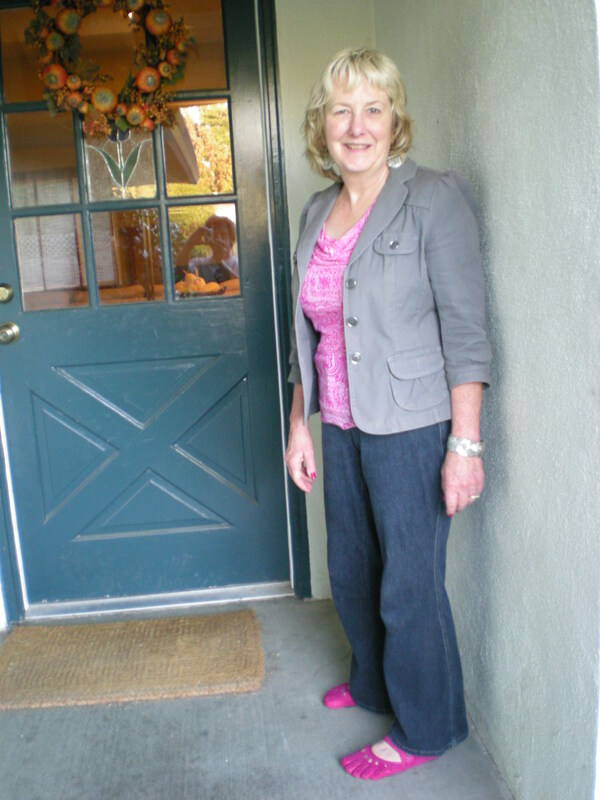 This week I decided to go with the FABULOUS pink Mary Janes. They are a good gateway Five Finger shoe. As you can see, they are very subtle. 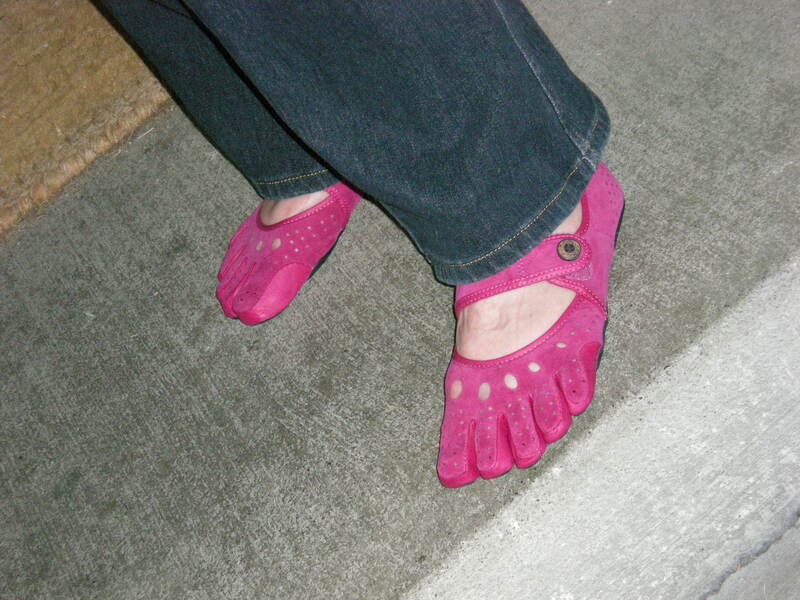 It’s hard to detect that they are Vibram Five Fingers at first glance. I have to tell you, these are very comfortable. The only thing better is no shoes at all. This entry was posted in Five Finger Friday and tagged Airedale, Minimalist Shoes, Paleo Lifestyle, Vibram Five Fingers. Bookmark the permalink. 7 Responses to It’s Five Finger Friday!!! Well, normally I’d just go barefoot since I’m entertaining family at home. But for you… Perhaps you could have Derek wear his too and we’ll have a photo op. It’s a deal…and it doesn’t need to be an all evening thing – I just want to see them live and in action! Those look soooo cute on you! The only reason I hesitated to buy those was because it said on the website that they’re meant for inside use, but then it also said somewhere they are awesome for traveling – geez, can’t remember. The bottoms have a little bit odf a sole. I found they were just fine for getting from my car to inside. This did not appear to cause any wear and tear on them. It took my co-workers a few hours to notice. They thought it was hilarious. I love mine! I bought two pairs: one for me, and one for the little one http://www.facebook.com/photo.php?fbid=228556447185610&set=a.185157781525477.34749.100000937703924&type=3&theater Do you know they won’t allow him to wear them in gym class? They are not “sports shoes.” I was so peeved when he came home and told me that! I love it. Send me a photo of the two of you rocking your Five Fingers. I’d love to feature you on a Friday. I’m sure folks are getting tired of looking at me. 😀 Boo hiss on the establishment not letting the little guy wear them for gym. I might be perverse enough t fight about it. It would depnd on m current mood.